the remnant of a volcanic explosion eons ago. The hardened lava formed basalt columns that are pressed together in interlocking arrangements. Most of the columns are hexagonal, giving the entire area a surreal experience, almost like it was designed by some mad, postmodern architect, or aliens. Perhaps more remarkably, neither of these is the case. 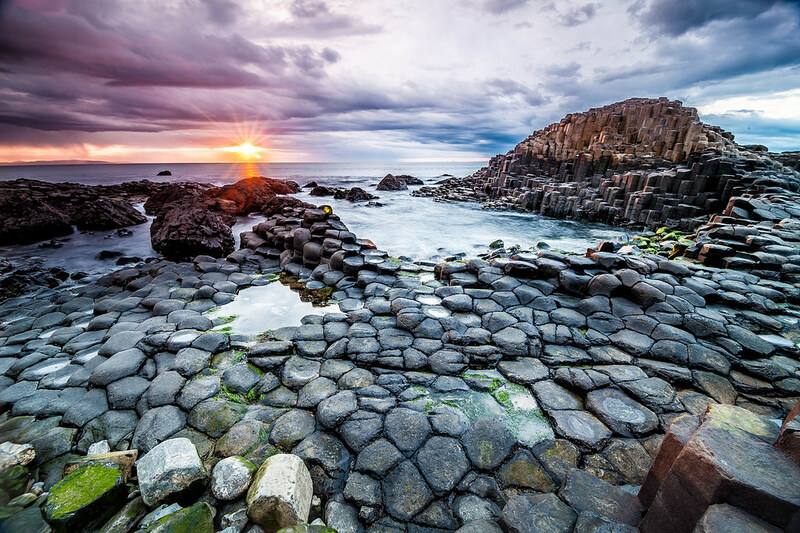 Giant’s Causeway is a natural phenomenon, one that you have to see with your own eyes. Giant’s Causeway is in County Antrim of Northern Ireland. It has been a national nature reserve since 1987. It has been called one of the great national wonders of the United Kingdom. And though there are international attractions bigger and taller, few have the mystique and natural elegance of Giant’s Causeway. The fact that you can walk and climb on these natural basalt formations is another mark in its favor. From individuals traveling alone or in pairs, to parents traveling with children, Giant’s Causeway is a perfect place for a day trip. Traversing the irregular columns isn’t physically demanding, but care should be taken to avoid tripping. The columns range from a few inches tall, all the way to 28 meters in height. Different height ranges tend to be grouped together, so that you can climb gradually growing column groups like hills. It’s really remarkable to see and experience. You’ll definitely want to have your camera with you, as this is a sight that’s hard to describe and even harder to believe for people who haven’t seen it themselves. It is estimated that Giant’s Causeway was formed between 50 and 60 million years ago. Volcanic activity broke through chalk beds that still reside well beneath the surface of the area land. As the lava intruded upon the surface of the ground, it gradually cooled and dried. 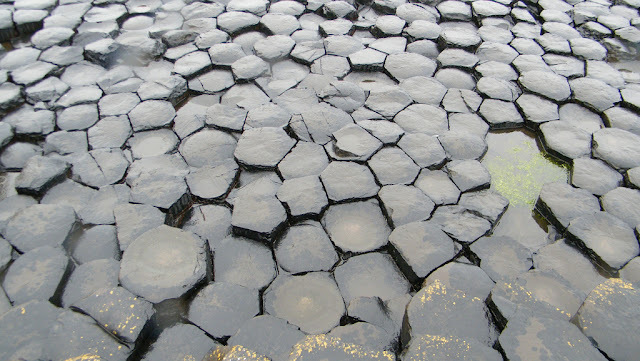 If you’ve ever seen what happens to mud when it dries in the hot sun, you can well imagine why Giant’s Causeway formed its characteristic hexagonal column shapes. Just like mud cracks in radiating patterns, similar shapes formed in the lava. Many people don’t know that there are also cracks running horizontally through the columns, but each crack fits together like a ball and socket. Giant’s Causeway became world famous in the late 17th century. Tourists have visited it nonstop since, and today is no exception. Allen’s Tours is one of the best bus tours available to and from Giant’s Causeway so take a look at that if you are looking for a more relaxed experience than driving yourself. Tourists can enjoy learning lots of information about the Causeway’s colorful history, as well as the surrounding village life. For people leaving Giant’s Causeway, there is a wonderful food and drink scene welcome to tourists and local visitors. In the end, Giant’s Causeway is a wonderful place to visit no matter what you choose to do thereafter. It’s one of those natural wonders that makes travel to a new country worth it all by itself. Have you made it to Giant's Causeway? Tel us what you thought in the comments section below!